As the world’s first and only preparative iCIEF solution, the CEInfinite instrument system is an innovation of traditional imaged capillary isoelectric focusing (iCIEF). By using ancillary equipment, and patented separation & fraction cartridges, the system is able to transfer separated proteins into a fraction collector for further mass spectrometry (MS) or other analyses. During the transfer process, the resolution is not altered. This implementation is a solution which solves the challenges in biopharmaceutical applications for micro-preparation, purifying proteins, as well as characterizing proteins. Using living systems to make protein biologics makes them vulnerable to post-translational modifications. These alterations generate an almost negligible change in a protein’s molecular mass but do noticeably change the isoelectric charge of a protein. iCIEF generates a profile of the proteins separated by charge, thus visualizing the presence of these charge variants relative to the main “target” protein. Isolating these peaks for identification would provide invaluable information for stability studies, as well as formulation and processing control. The CEInfinite Preparative iCIEF instrument is able to push out separated protein peaks one-by-one after focusing. This was made possible through the innovative design of CEInfinite proprietary cartridges: a large inner diameter (ID) separation capillary connects to a smaller ID transfer capillary with an exclusive interface to minimize remixing of the peaks after separation. This separation is demonstrated below in Figure 2 with the NISTmAb RM 8671. With the CEInsight CFR software, simply mark the start and end of each peak of interest and the program will tell you when that peak is ready to be collected. This technology can also be applied to other biologics such as enzymes, fusion proteins, antibody-drug conjugates (ADCs), etc. 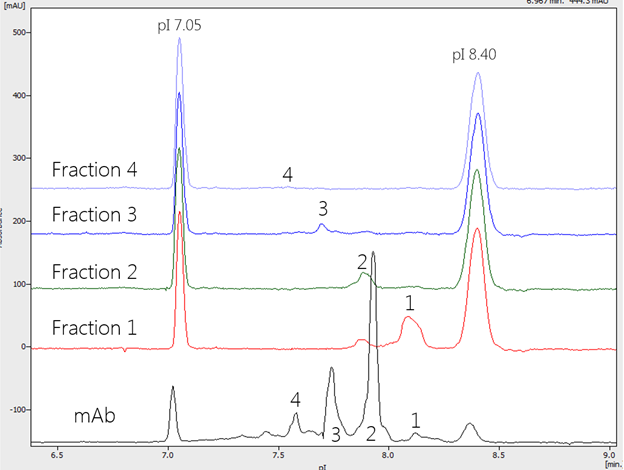 A potential limitation of this fractionation, using mAbs as an example, is that due to the direction of peak mobilization and collection, it is easier to get a purer fraction of the more basic peaks than the acidic peaks. To remedy this issue, the CEInfinite Preparative instrument offers the capability to reverse the polarity for focusing, allowing more acidic peaks to be on the side of the instrument where fractions are collected. MS coupling is a powerful high throughput characterization solution for protein identification. 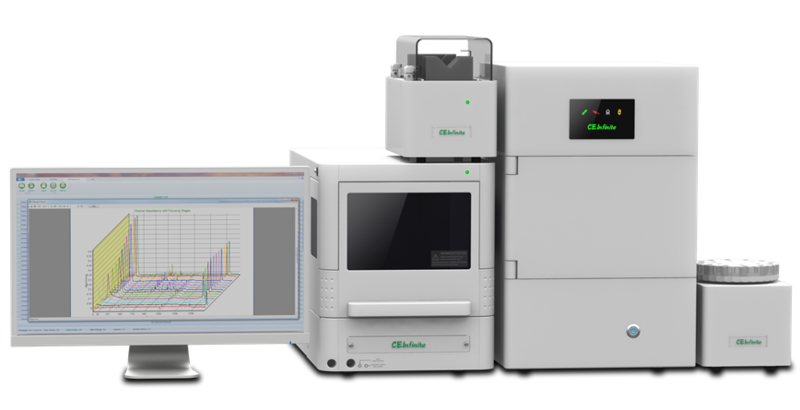 The outlet of the CEInfinite Preparative iCIEF instrument can be directly connected to a mass spectrometer to deliver fractionated protein samples for characterization (iCIEF-MS).